Cloud computing price drops make easy reporting – they happen regularly and have an attractive way of framing the IaaS market as a battle royal between a few different players. They’re also easy for vendors, a price drop takes little explanation and it’s a message readily digested by customers. But price is only part of the equation and the relative performance of cloud vendors is an important, if often ignored aspect. Which is why a couple of announcements from ProfitBricks (more on them here) is pretty interesting news today. First the easy part. ProfitBricks is dropping its IaaS prices by 50% and in doing so is reaching a price point which is roughly half that of its major competitors. Which gets us to the second part of the news. How does one actually compare what something costs between vendors who all package their services in slightly different ways? While electricity has a very easy unit of measure (the kilowatt hour), IaaS doesn’t. This is where ProfitBricks is hoping to extend the conversation, alongside today’s news it’s also publishing a series of tests by Cloud Spectator which benchmarks ProfitBricks against AWS and Rackspace. The benchmarks were run to compare general server performance, file IO, and network. Cloud Spectator is the right testing party here – they monitor the CPU, RAM, storage, and internal network performance of over 20 of the world’s most well known IaaS services to understand important aspects of virtual server performance. Tests are run at least three times per day, 365 days per year to capture variability in addition to performance level. In general server performance, file IO, and internal network, ProfitBricks’s VMs outperformed Amazon EC2 and Rackspace in all tested VMs. In a comparison with Amazon EC2, the m1.medium and m1.xlarge instances were selected for this test and the same resource configurations were matched on ProfitBricks instances. Similarly, resource capacity for Rackspace’s 4GB and 15GB servers were matched on ProfitBricks instances. That’s a pretty black and white finding. I spent some time talking with Andreas Gauger, CEO of ProfitBricks about the company’s strategy and their desire to extend the conversation to one of deeper price AND performance. I started off by getting Gauger’s views on the price cuts that AWS, Rackspace, GCE and others have been introducing of late. Very interestingly, Gauger is adamant that, contrary to commonly held opinion, the major cloud providers are actually playing a very high margin game and the price drops are tiny in comparison to the efficiencies they enjoy. I wanted to dive into this contentious view deeper and so I discussed with ProfitBricks their justification for saying this. The company produced the following graph which shows AWS pricing on a particular instance type since introduction against the expected pricing if Moore’s Law holds true. While we obviously have no metrics about AWS’ cost structure and hence margin, it’s safe to assume that they done run a massively loss leading product line. That being the case we can see that the Moore’s Law expected price economies really haven’t been borne out in actuality. Gauger went so far as to say that based on their own costing figures, they believe all the major cloud vendors have similarly profitable operations and that he would expect some real price reduction to start to roll out going forwards in his words the existing vendors pricing is “obscenely high” – watch this space I guess! ProfitBricks is an interesting company. Their scale up as opposed to scale out approach is in contrast to the generally held consensus around the rightway to deliver IaaS. That said, the performance and price combination they’re offering starts to look promising. They’ve only been live in Europe for 18 months, and for less than a year in the US, so they have a lot of catching up to do. But hanging your hat on being 50% cheaper while more performant than the competition is certainly a good place to start. Of course with all the major IaaS vendors adding more and more higher-stack and added value services, it’s a little incongruous to have a vendor focusing purely on compute and storage. Having said that a pure focus on infrastructure helps them to eek out the performance efficiencies that seem to be borne out by the statistics above. Well that would be a little funny, if it wasn’t a little embarrassing! Also, sorry to say: Andreas’ position is not CEO but CMO; CEO of ProfitBricks is Achim Weiss, former CTO at 1&1. When a company uses a graph showing Moore’s Law as an indicator of cost, it’s time to get suspicious. Compute efficiency in no way translates straight into $$$ saved, to claim otherwise is downright misleading. [12:19:09 PM] Pete Johnson: We actually find for our IaaS that equipment is the driving factor of overall cost. In fact, a big factor in our price drop is the Moore’s Law effect on new clusters we just deployed. During our briefing with Ben, we pointed out that in 7 years AWS has dropped price just 40% while we were dropping 50% in just 18 months. 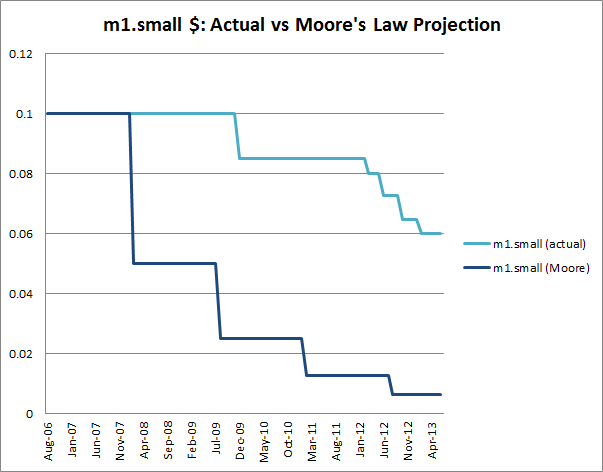 That led to a conversation about AWS price drops vs Moore’s Law and the result is the graph you see above.